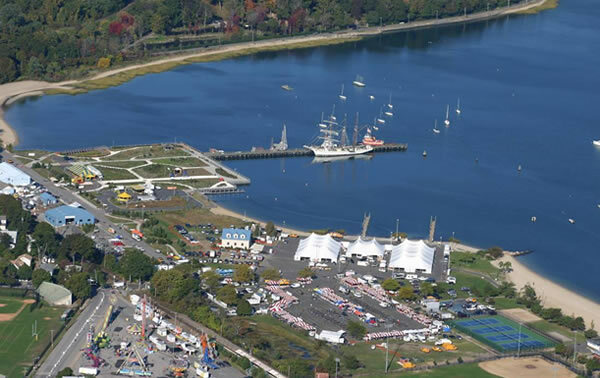 Each year more than 200,000 Long Islanders and visitors from near and far participate in the region’s largest street festival; a weekend of family fun, food and festivities hosted by the Oyster Bay Rotary. In 1998, the event marked record breaking crowds that reached 300,000. As we celebrate our 35th year, it will again be an OYSTERific Event with oysters served in every imaginable form; on the half-shell, fried and in chowder, as the highlight of the food promenade area. However, other seafoods such as shrimp and clams, as well as more traditional festival foods are available. All foods are prepared and served by various Oyster Bay civic and non-profit organizations, making the Oyster Festival one of the regions most significant fund raisers. The Festival includes a food promenade area, a juried Arts and Crafts Show, continuous entertainment, an Oyster Eating Contest and Oyster Shucking Contest, a 5k Run, a Children’s Entertainment Area, a Historic Boat Exhibit. Oysters are unique to the Oyster Bay community where they have been harvested for hundreds of years. Our founding sponser, Oyster Bay based Frank M. Flower & Sons, has continued this tradition since 1876. They provide the oysters for the festival and they are the only surviving harvesting, oyster company in New York State. More than 50,000 oysters on the half-shell are consumed each year at the 2 day event, not counting the oysters prepared in so many other ways. If you are planning on coming to our village for the Oyster Festival (or at any other time) you may want to take advantage of Lodging facilities located nearby. One option is the East Norwich Inn (800-334-4798) located within a less than 5 minute drive the downtown Oyster Bay. Another option is the The Tides Motor Lodge (516-671-7070) in Bayville, NY. Although this location is a bit out of the way the scenic drive from the motel to downtown Oyster Bay down West Shore Road is breathtaking. The motel itself is located across from Charles Ransom Beach and is right off the Bayville Boardwalk. Coming from Points East or West the best travel option is to take the Long Island Railroad to the Syosset Station. From there, shuttle buses will take you to downtown Oyster Bay for the Festival. Another option is to drive to the Syosset Train station, park and ride to the Oyster Festival. It is highly recommended that you avoid driving down to downtown Oyster Bay as most of the roads are blocked off.